Hard to believe its been over 15 years since I retired! Doesn't feel like I'm retired with everything going on. No signs of boredom yet. Actually I made the decision to retire in a rather short period of time. I was always planning on bailing out of my job a few years early, but then 9/11 came along and the government took all the fun out of my job. One day it occurred to me that I just wasn't enjoying what I was doing anymore. Funny that it happened to occur after I had just spent a week fishing up in Canada. It was all I could do to go back to work after the fabulous time spent there. So I started asking my other retired friends their advice and opinions and it was unanimous: Do it if you can! I started figuring out the finances and figured it was worth a shot. In October '03 I had my twenty years in and could qualify for a pension. As meager as it was, in November I took it and that was that, my airline career was over. Yes, I left my job quite early as a Captain for a major US airline - and we weren't even in bankruptcy! My only regret is not knowing maybe five years earlier that I would be retiring that soon and then I would have made some different financial decisions. And if I had known that the economy was going to go down the tubes a few years later, I would have stayed on a couple more years. Oh, well..... I have yet to regret my retirement decision. I've had no shortage of things to keep me occupied. My passion now is scuba diving, so I try to get in several trips every year to various spots around the world. For about ten years, I also kept busy by working part-time at the local dive shop as an instructor. Another activity involves fishing in Canada at a place I've been visiting for over 25 years, the Pennsylvania Club. Located on the shores of Georgian Bay, it's in a setting of utter beauty and peacefulness. I am usually up there 5-6 weeks every season, spread out over several trips from May to September. I run the club's website, so that also takes up some of my time (but absolutely worth it). Some of my early history: as a military brat our family did our share of moving around. I was born in California, then we were off to Florida, the French Riviera (the Navy used to have some great duty stations) and Virginia. Seven different schools for my first eight grades. After his retirement, my dad moved us back to Europe, where I spent my high school years. Loving the mountains but wanting to find some place where the sun shines (Geneva, Switzerland is one of the dreariest places to be in the winter), I picked Colorado for a university. Four years there and then I followed in my father's footsteps and became a Naval Aviator. I know he was disappointed that I wasn't a 'lifer', but six years was plenty for me. Remember, this was post-Vietnam and the military wasn't held in such high regard as it is today. It took over three years after leaving the Navy to find an airline job. How many of you remember PeopleExpress Airlines? Stints flying gliders and towplanes in Colorado Springs and a year in Saudi Arabia preceded my getting hired for the New Jersey-based airline. Best job I ever had, while it lasted. Unfortunately, things don't stay static too long in the airline business, so we found ourselves bought out and merged into another airline - Continental. For a while there it was like the military again. Not the airline with the best reputation around (remember Frank Lorenzo?). Things did turn around eventually, and I know I am biased, but Continental turned into one of the best airlines around. Now with the merger with United, it's getting interesting again. I just hope they survive this latest business cycle.... My pass privileges depend on it. 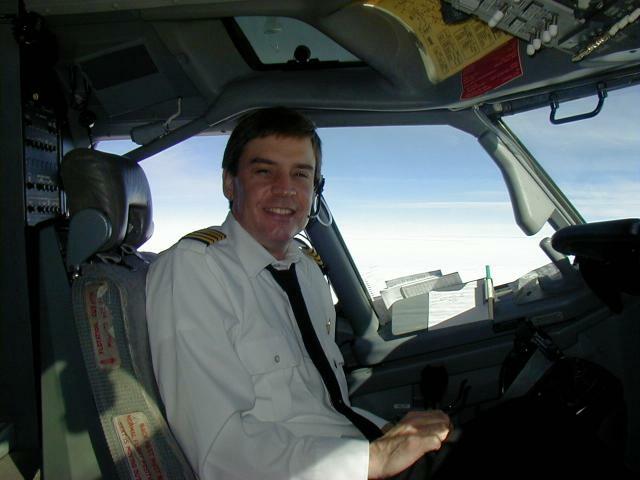 My last flight as an airline pilot.